See the author’s website for the book for audio, video, and color images from his fieldwork. 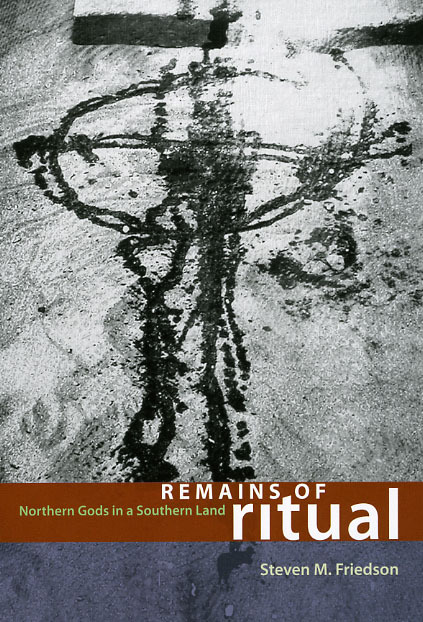 Remains of Ritual, Steven M. Friedson’s second book on musical experience in African ritual, focuses on the Brekete/Gorovodu religion of the Ewe people. Friedson presents a multifaceted understanding of religious practice through a historical and ethnographic study of one of the dominant ritual sites on the southern coast of Ghana: a medicine shrine whose origins lie in the northern region of the country. Each chapter of this fascinating book considers a different aspect of ritual life, demonstrating throughout that none of them can be conceived of separately from their musicality—in the Brekete world, music functions as ritual and ritual as music. Dance and possession, chanted calls to prayer, animal sacrifice, the sounds and movements of wake keeping, the play of the drums all come under Friedson’s careful scrutiny, as does his own position and experience within this ritual-dominated society. "This volume consists of an engaging and well-written text that incorporates layers of anthropological, ethnomusicological, and philosophical analyses of increasing complexity, augmented by extensive endnotes, which make it accessible to a wide general audience."